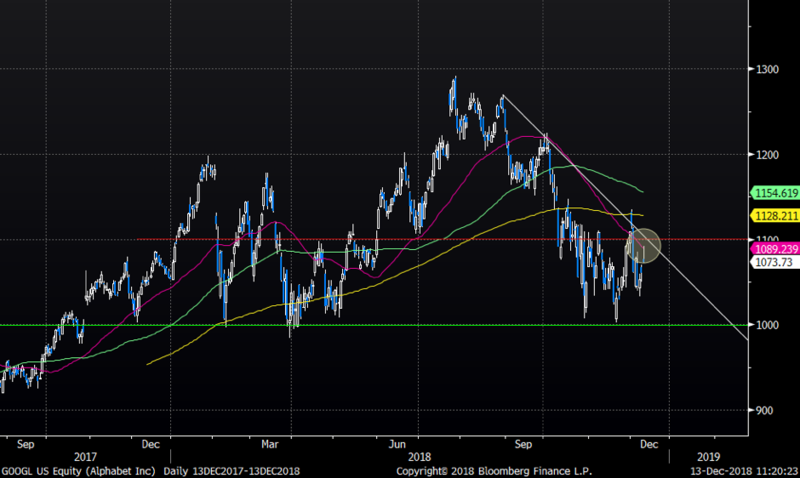 As global geopolitical headlines have been hitting the tapes over past weeks, the FAANG space as a “theme” has been in hibernation. In late September we asked ourselves if the FAANG space was in bubble territory. We concluded that: history does not repeat itself, but is rhymes. Below are the FAANG charts worth reviewing just in case you forgot about these (ex) hot names. 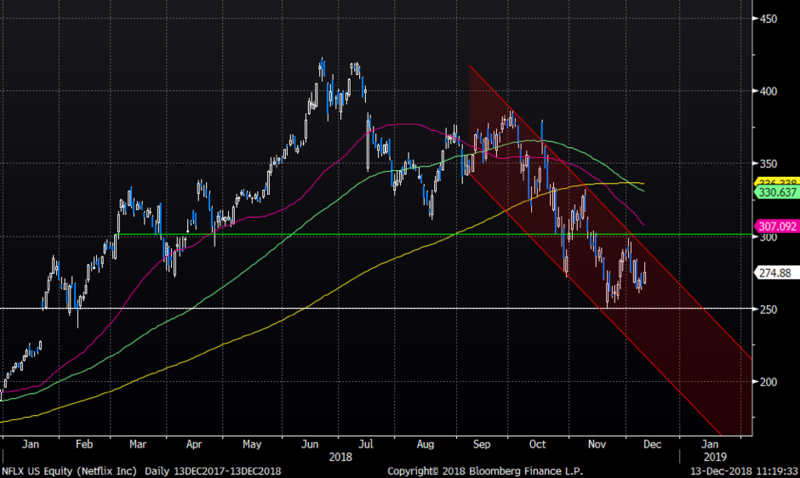 Facebook continues trading inside the perfect negative channel that has been in place since August. Note the stock briefly touched the 50-day average yesterday for the first time in ages. FB is up 16% from recent lows, but that negative channel looks solid still. Apple was the last one to join the FAANG implosion. The stock has tried a few bounces lately as we saw some sort of local low put in on that Qualcomm/Apple reversal a few days ago, but we must admit the bounce lacks proper “fizz”. 160/170 is support area, while 180 is the first real resistance. Amazon is up 20% from panic lows in late November. Bounces like the one we saw are violent, but not surprising given the volatility we have seen in this name. Note the stock reached the 200 day yesterday. 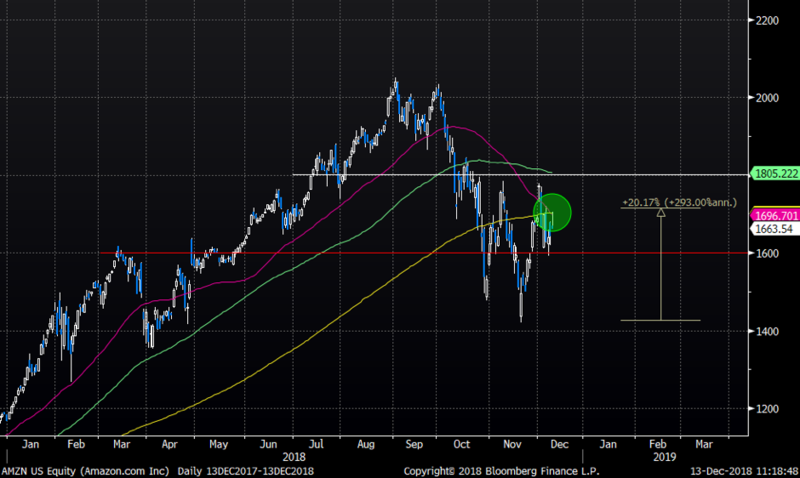 1600/1800 seems like a fair short-term range for now, but do pay attention to the “light death cross” possibly forming as 50-day trades just at the 200 day. 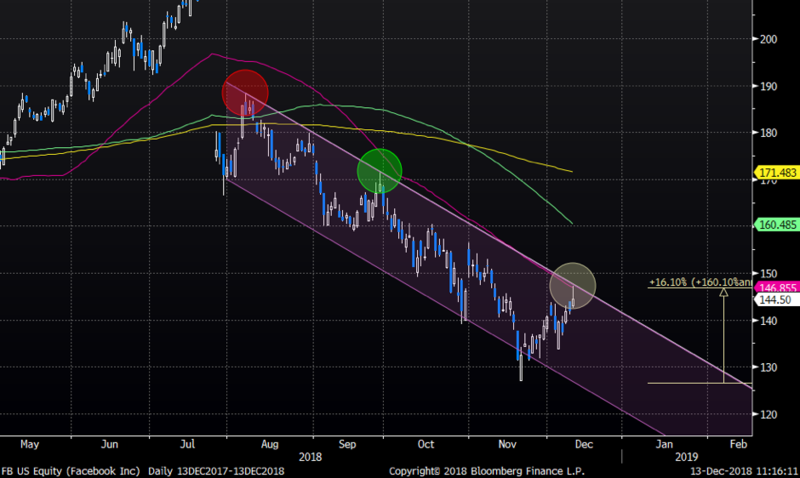 Netflix remains trading inside the negative trend channel since September. Recent moves have been less extreme compared to many “peers”. 250 is the big support and 300 the big resistance. The short-term averages are negatively sloping, and don’t forget the death cross that was formed a week ago. 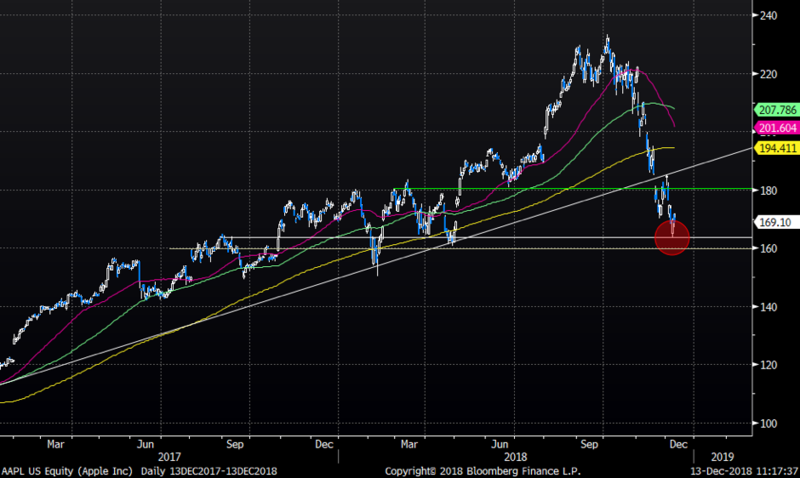 Google has been attempting to form some sort of bottom over past months, but price action is still not overly impressive. The negative trend line since August is still in place. The stock reversed on the 50-day average yesterday. First big resistance is at 1100 while the big support is down at the 1000 USD level. With most FAANGs having bounced lately, they still remain in down trends and seem to need more consolidation before any “proper” attempt to break up could be possible. The entire space seems to need more hibernation.